The countryside yields a meagre harvest in the final few weeks of winter. I found myself clutching at straws in late January; returning from the wood with nothing but a couple of herb bennett leaves and a bag of pine needles. There's a bit of young nettle growth knocking around, but that's about it. So it was with genuine excitement that I wrote about the emergence of hawthorn shoots last week. These young leaves have a gentle nutty flavour; it's best to pick them now as they get increasingly bitter with age. Spring abounds. Nearly. Heat your oven to 200C/180C fan/gas 6. Give the beets a good scrub; dry with kitchen paper, then quarter. Season in an oven-proof dish, drizzle with olive oil and roast for about 45 minutes. Mix the creme fraiche and horseradish together in a small bowl. 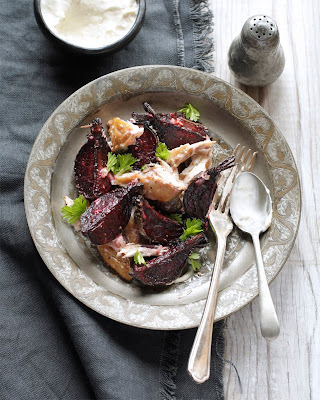 When the beetroot is cooked, transfer into a medium-sized bowl, flake in the mackerel and spoon in the horseradish cream. Toss briefly with salad tongs, just so the beetroot and mackerel lightly catch the horseradish cream. Serve with a squeeze of lemon juice and fresh hawthorn shoots. Delicious - Ilove beetroot. Horseradish and smoked mackerel are inseperable.Good result. Lots of great strong flavours on one plate. I often combine beets with horseradish, but haven't thought of smoked mackerel. Thanks for the tip!